The battery community has been intensely studying silicon anodes due to its capability of delivering 3~5-times higher capacities compared with those using existing graphite anodes in lithium ion batteries. A greater capacity means longer battery use per charge, which is mainly critical in prolonging the driving mileage of all-electric vehicles. Although silicon is plentiful and economical, Si anodes have a restricted charge-discharge cycle number, which is usually less than 100 times with microparticle sizes. Their volume expands immensely during each charge-discharge cycle, resulting in fractures of the electrode particles or delamination of the electrode film equally even in decaying its capacity. A molecular pulley binder created by a KAIST research team headed by Professors Jang Wook Choi and Ali Coskun for high-capacity silicon anodes of lithium ion batteries has been reported in Science in the July 20th issue. The KAIST team combined molecular pulleys, called polyrotaxanes, into a battery electrode binder, a polymer added into battery electrodes to attach the electrodes onto metallic substrates. In a polyrotaxane, rings are threaded into a polymer backbone and can easily move along the backbone. The free moving of the rings in polyrotaxanes can trail the volume changes of the silicon particles. The sliding motion of the rings can capably hold Si particles without crumbling during their non-stop volume change. It is extraordinary that even pulverized silicon particles can stay coalesced due to the high elasticity of the polyrotaxane binder. 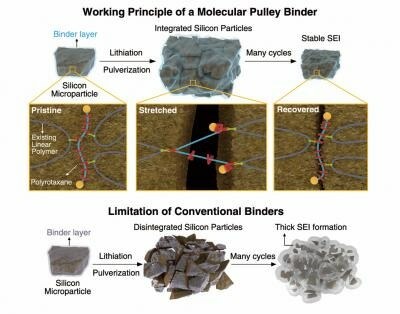 The functionality of the new binders is very different from current binders (typically simple linear polymers) with limited elasticity since current binders are not capable of holding pulverized particles tightly. Earlier binders allowed pulverized particles to scatter and the silicon electrode thus worsens and loses its capability. The Authors said, "This is a good example of showing the importance of fundamental research. Polyrotaxane received Nobel Prize last year, based on the concept called 'mechanical bond.' The 'mechanical bond' is a newly identified concept, and can be added to classical chemical bonds in chemistry, such as covalent, ionic, coordination, and metallic bonds. The long fundamental study is now expanding in an unexpected direction that addresses longstanding challenges in battery technology." The Authors also stated that they are presently in partnership with a top battery Manufacturer to get their molecular pulleys incorporated into real battery products. Mechanical bonds have come to the rescue for the first time in an energy storage context. KAIST team's ingenious use of mechanical bonds in slide-ring polyrotaxanes - based on polyethylene glycol threaded with functionalized alpha-cyclodextrin rings - marks a breakthrough in the performance of marketable lithium-ion batteries. This important technological advance provides yet more evidence that when pulley-like polymers carrying mechanical bonds displace conventional materials based on chemical bonds alone, the unique influence of this physical bond on the properties of materials and the performance of devices can be profound and game-changing.